Wanna See My Costume Jewelry Collection? 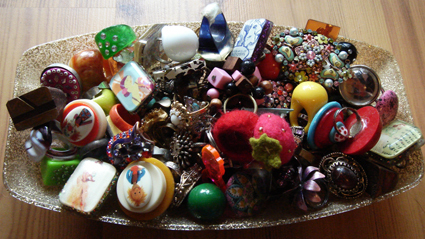 Love the look of vintage costume jewelry, but don’t have the patience to dig through antique shops to find it? Don’t worry I’ll do the hard work for you. That is what our entire Les Classiques section is about. 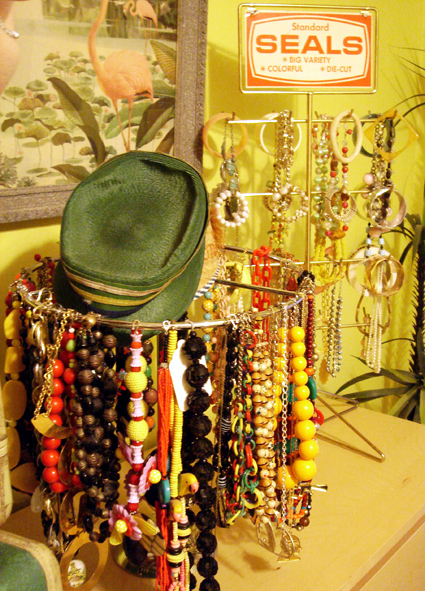 All the pieces rings, pins, purses, bracelets and necklaces are vintage costume jewelry some of it signed! 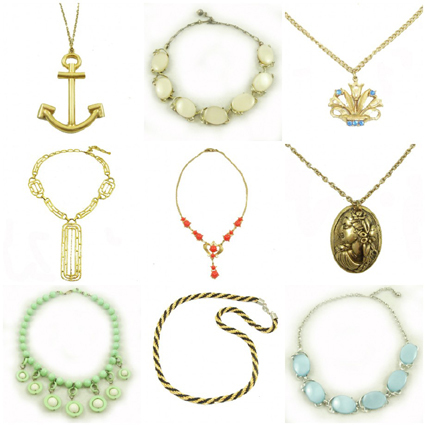 Yesterday we added 10 new vintage necklaces to Naughty Secretary Club ranging in age from the 1940’s to the 1970’s. Take a peek and treat yourself. As an added bonus I got to thinking about my own stash of vintage costume jewelry I have around the house and thought you might like to take a closer looksie. You have seen some of these pieces before in the How Ya Hanging Jewelry Display post and if you took the virtual tour of my entire house on Apartment Therapy things might look familiar, but these are all new pictures. Hope you like! Posted April 26, 2009 & filed under collecting, Jewelry. I love your collection! Very cool! I have a nice little collection myself. You know the sad thing is that I don’t wear much of it at all. With the baby I hardly go out, but even before that I have my standard go to items and rarely mix it up. I should branch out. OMG!!! You inspire me to dig out my collection hiding in various drawers and boxes and put it on display, but then I would have to figure where to put all the skating pieces that are currently out. Perhaps if I hung some on a quilt like the Sonja quilt that is embellished with Ice Follies’ jewelry. Oops, the light bulb just went off for a retro quilt to display jewelry. Beautiful!1 you should turn these pics into postcards and sell them!!! hope you are doing fab-o and that la niña bonita is not keeping you up too late at night!! sending love!!! those enamel flower pins cause my heart to skip a beat! 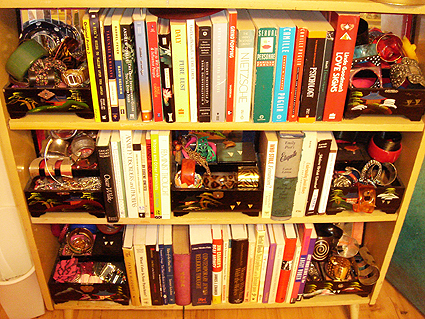 Digifigi – I used to have all my jewelry in boxes and drawers but it is just too pretty to keep hidden away. Gee wiz.. I’ve been collecting metal flower pins for about 2 years, and I only have 5 of them! Oh, and I wear mine while I’m out face painting(my day job!) I’ll gladly buy your collection off of you if you’re interested! 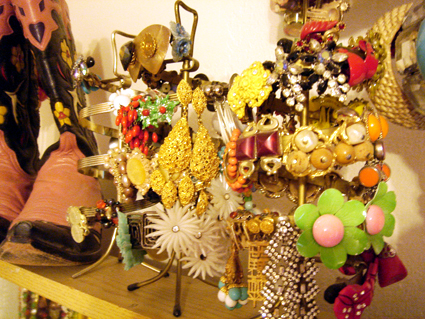 Now I keep and collect all kinds of vintage jewelry..it is so fun to wear!P.S. I agree with Kathy(the crafty chica)Your collection pics would make great cards and stationary. really cards? i thought these pictures looked a little yellow. which pictures do you guys like the best? i like the one with the pins. 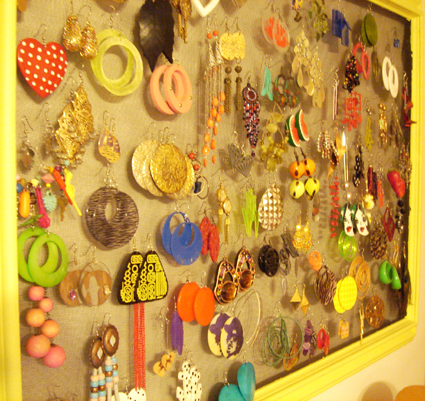 The pins certainly, the earing holders (with a little cropping), the tray of rings, and the wall of earrings. The pix are a little yellow or lacking contrast, but nothing that can’t be fixed with photo editing software. What fabulous display ideas! LOVE the peg board! Ashley the blonde on the pin is actually Vince Neil from Motley Crue. A Jem pin would be pretty rad. That is a crazy amount of jewelry. I heart it when people have just absolutely mad collections of things. Julie the crazy thing is this is not even all of it. 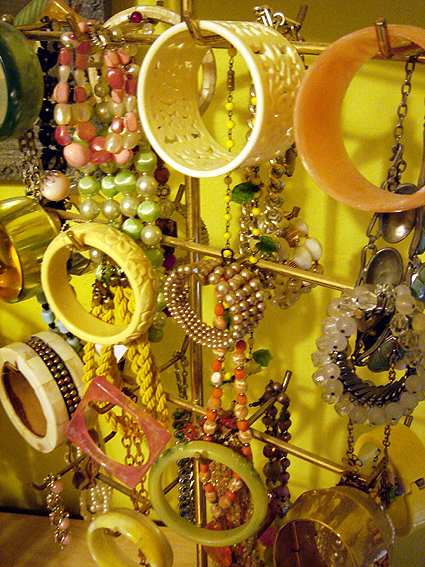 Not to mention I didn’t take pictures in my studio which is stuffed full of handmade, new and vintage jewelry! You are insane – in a good way of course 🙂 I love all the flower pins. I’m not a jewelry girl, but I could wear a different one of those every day. ya know I love those flower pins, but of all the accessories in the world I find brooches the hardest to wear. Maybe because they can be heavy and in Texas you wear light weight clothes so pins pull. oh i love it i love it! made me drool! Looks like I should start posting more pictures of my collections. Which shall be next: purses, Fisher Price Toys, Dream Pets, shoes, Hawaiiana/Tiki, aquarium furniture, shell lamp, wedding cake toppers – so many choices! The jewelry is amazing! Looks like someone has as much as I do, and I didn't think that was possible. I love the pins. All the displays are beautiful. There is another wonderful benefit of buying Vintage jewellery online is that you can save a good amount of your money. very good collection. You did a very hard work collecting these jewelry. thanks for sharing. You inspire me to dig out my collection hiding in various drawers and boxes and put it on display, but then I would have to figure where to put all the skating pieces that are currently out. 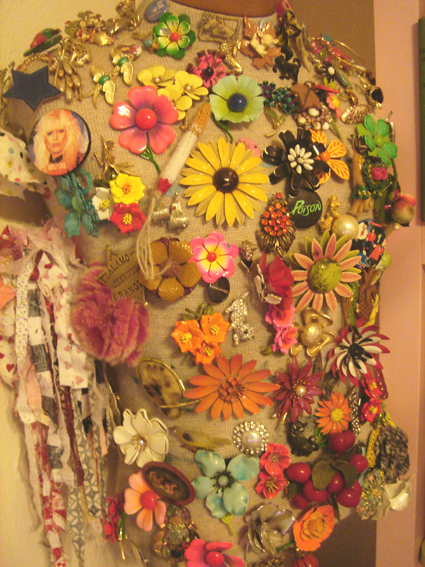 Perhaps if I hung some on a quilt like the Sonja quilt that is embellished with Ice Follies' jewelry. Oops, the light bulb just went off for a retro quilt to display jewelry. 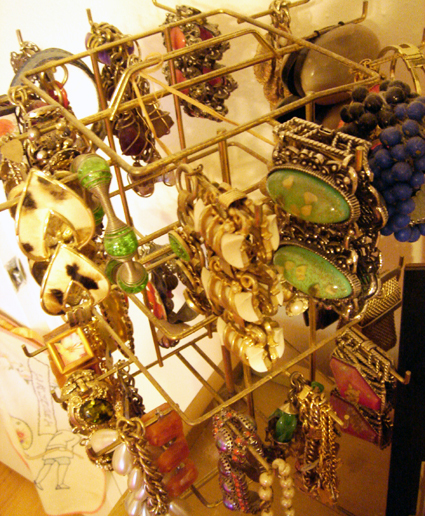 Now I keep and collect all kinds of vintage jewelry..it is so fun to wear! The jewelry is amazing! Looks like someone has as much as I do, and I didn't think that was possible. I love the pins. I want to buy some vintage jewellary for my girlfriend. Give me suggestions what should i buy for her.